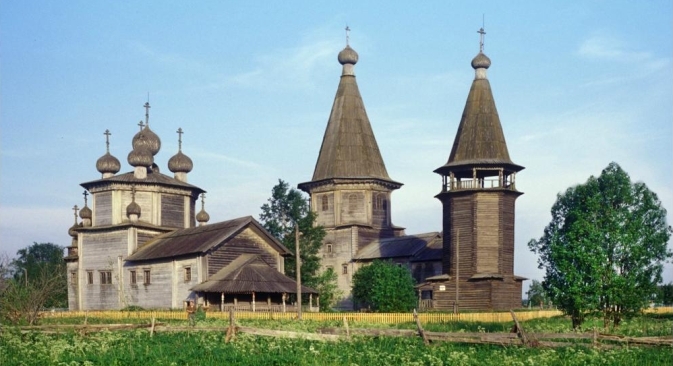 Lyadny is a place in Arkhangelsk Region on the North of Russia, where you can see monuments of wooden architecture and old Russian churches. Update: On May 5, Orthodox Easter Sunday, the ensemble of churches at Lyadiny caught fire and several of the buildings burned to the ground. Firefighters managed to save the Church of the Epiphany, but were unable to preserve the Church of the Intercession of the Holy Virgin and the adjacent bell tower. The fire reportedly began in the church's unique tent roof and spread through the rest of the structure.